December 5-11, 2016 was Computer Science Education Week, where students around the world participated in Hour of Code. Hour of Code is a one-hour introduction to computer science designed to demystify coding for students and encourage them to pursue technology careers. It is a global movement reaching tens of millions of students in 180+ countries. 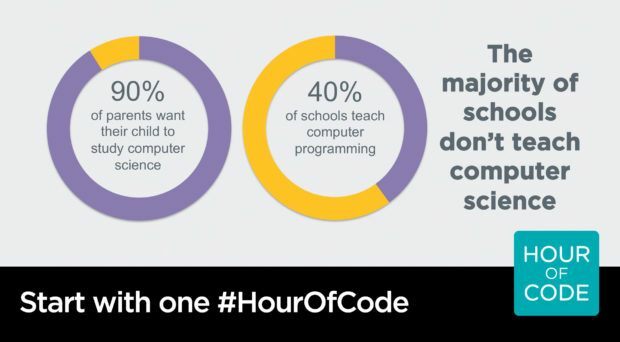 The Hour of Code campaign was started by Code.org in 2013. Today, over 100 million students participate—one out of every 10 students on the planet. In fact, according to Hadi Partovi, CEO of Code.org, the initiative has also inspired some 400,000 classrooms to begin teaching computer science classes. In addition, hundreds of school districts have made commitment to add it to the curriculum. Anyone, anywhere can organize an Hour of Code event. The one-hour tutorial is available in over 45 languages and no experience needed. In 2016, 151,994 Hour of Code events took place all around the world! In Las Vegas, The Innevation Center hosted local students for Hour of Code events on Monday, December 5, 2016 and Wednesday, December 7, 2016. Read more from The Innevation Center team here! To get involved in Hour of Code in 2017, visit the organization online.